She was born in Mie prefecture. In 1969, she graduated at Kyoto city University of Fine arts (Presently, Kyoto City University of Arts), fine art division, western paintings. She started to learn the craft of Noh mask in1983. 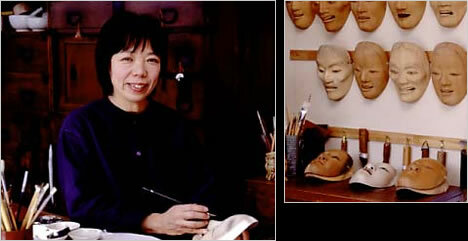 She studied under noh mask craftsman Mr. Yasuemon Hori from 1990 and fully devoted to creating Noh mask since then. Her masks were adopted by numerous Noh actor such as Kanze Soke. She also, provides instructions on how to make Noh mask in Tokyo,Osaka and Kyoto. Her Noh masks are being collected by domestic and foreign art collectors. Since 2014, the Fundação Oriente museum in Portugal collected some Noh masks. She appeared many times on TV programs, newspapers, and magazines. In 2012, Television advertising and video advertising inside of the train, "Kitakore!" Other than from listed above, learning materials such as school textbooks, magazines, publications, and corporate advertising adopted to use her Noh masks.